Unlike the noise of sexual harassment in the workplace, bullying at work is referred to here as a “silent epidemic.” It can affect a person’s dignity, self-esteem, job, social relations, or health. It can even drive a person to commit suicide. The authors quote from a 1999 health journal that “generalized workplace abuse was four times more prevalent than sexual harassment in a study of several work-related groups.” Bullying differs from sexual harassment in that it is not necessarily sexual in nature. It may be constant criticism or backstabbing from a coworker who wants to advance at the expense of making others appear incompetent. Bullying tactics include blaming, insulting, criticizing, making unreasonable demands, stealing credit, threatening job loss, or any other behavior intended to humiliate or control others. In this well written and thoroughly researched book, the authors apply their experiences in psychology and psychotherapy to help readers cope with this situation in a variety of ways. 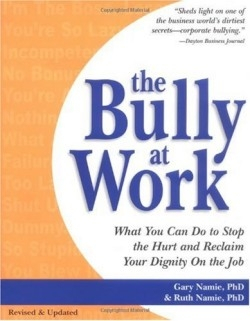 This book grew out of the Campaign Against Workplace Bullying started in 1998 and the nonprofit organization’s efforts to increase awareness of this problem. It offers advice for victims of bullies on how to interpret the harmful actions and how to deal with them. It recognizes that this is an emotional battle and that the victims are at various stages of coping, and provides suggestions for each step in the process. It discusses BullyProofing oneself to regain dignity and self-respect and then BullyBusting to fight back and put an end to the situation. It recognizes that fighting back in an aggressive way may not be best for everyone, and it’s very honest in its advice for readers.